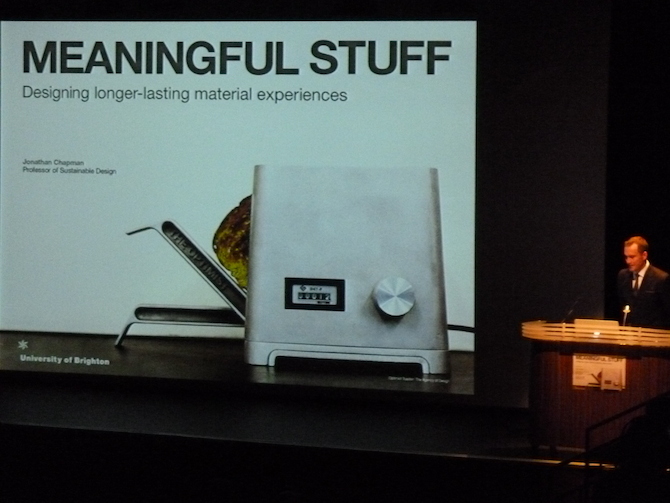 Meaningful Stuff – Designing longer-lasting material experiences – the inaugural lecture of Jonathan Chapman, Professor of sustainable design at the University of Brighton. Delivered at the Sallis Benney Theatre Grand Parade on Weds 22nd of January 2014. Today is a day of contrasts. I spent the day at BETT, the learning technology trade show, which took over (most*) of the Excel centre. BETT is a chance for unwary wide-eyed heads to be dazzled by shiny baubles, and part with their slender budgets. It has evolved somewhat over the years, and now has a far more international feel, yet sadly fails to offer anything truly innovative, or well designed. I’ve been told the patent on LEGO has expired which would explain the proliferation of robotics kits that mimic LEGO mindstorms… though lacking a certain build quality. I did meet some old colleagues, which was delightful, and I dodged the loathsome Gove, who gave the keynote opening address. I also had a useful chat with the Blackboard folk about their Mosaic product, which whilst it professes to be an institutional app builder requiring no coding, didn’t quite convince me – I need to see more. In contrast the evening was spent at the inaugural lecture of Dr Jonathan Chapman, Professor of sustainable design at the University of Brighton. It felt very much like a commentary on the excesses of the morning. Jonathan talked about the great illusion: a smart phone appears to weigh just 200g, but the cost of production is closer to 500kg, the weight of a horse. Around 78kg of CO2 alone. So when you lift your phone to your ear, you are in fact lifting a horse to your ear. The problem is that finding out such facts is quite terrifying, and can be paralysing – what can we do in the light of such information? Jonathan’s answer was to submit totally to the fear, and head off and live on a Buddhist community on Hokaido. For a while he felt happy, he was at one with crickets and such like, having no impact on the environment, then the realisation struck him that having no impact was merely abdicating responsibility. He returned to the UK to try to engage in teaching a better way of design. it takes 40 tonnes of waste to make 1 tonne of consumer electronics, 98% of which will be discarded within 6 months. An efficiency of 1%. The zero is the hope for the future. The built-in obsolescence of consumer goods originally seemed like a cracking idea, it was proposed by Bernard London in 1932 as a form of quantitive easing. The idea was to get the 1% of folk who had money to spend it, creating jobs for the 99% who didn’t. Unfortunately it continued, and now is endemic in systems like mobile phone production, where the average lifespan of a handset is just 18 months. The question is why is something that we desire so much, is worthless after such a short interval. It seems we need to look at the narratives we tell about objects. Some like the worthless pasta necklace gifts from our children, take on such meaning personally that they become priceless. So what is needed is a design philosophy that promotes meaningful attachments, engendering product longevity? * the South side of the Excel was running a slot machine trade show, and the juxtaposition of banners for educational technology, with those for the arcades, (promising to squeeze every last penny out of punters), brought a grin to my face… the visitors to the arcade show seemed a lot happier, and far less earnest.